Having now spent several days in Gary Erickson’s studio and apartment as I help the family in closing out Gary’s professional life I find myself immersed not only in his work, but also in my memories of his life. I met Gary in 1992 when my new school, Concordia University, St. Paul, hosted an exhibition of his work after he had served as a sabbatical replacement for a term the year before I arrived. His work was impressive and a challenge to our students, but his persona was even more notable. He was instantly engaging, warm, accepting, gentle and fun. His impish humor bubbled forth without being forced or trying to impress. I knew in those first moments that this would be a man with whom I would wish to spend time in my new city. Our quickly discovered mutual love of golf would cement the friendship into place that next summer. 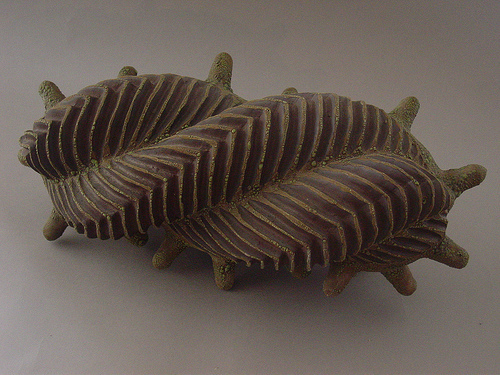 Gary’s sculptural forms back then were mostly inspired by biomorphic growth patterns in plants. But as the years passed I watched him fold his many varied interests and experiences into innovations in his work. His love of gardening mixed with a love of salsa dancing and those rhythmic patterns began to inform his pieces. His travels to Cuba changed his knowledge of dance patterns and his work responded as well. His love of Minnesota and our glacier deposited stones and rocks became clay pebble wall installations that supplemented his tile explorations. When he ceased his Cuba travels and started his ongoing travels to China, the new materials, techniques and imagery responded again. His teapots from those experiences explored a range of imagery from ancient Chinese traditions to tongue in cheek Communist kitsch. His spiral forms were still connected to his early sculptural directions, but gained an elegant specificity that crossed cultural ties and became universal. Of course, all the while, he never stopped creating unique vessel forms that were very different than the ‘Mingeisota’ style so frequently found in the upper Midwest. His openness to innovation and prolific exploration transcended the current expectation of artists to only explore their one singular ‘look’. 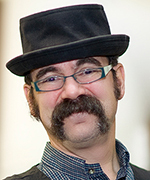 Gary loved NCECA and attended conferences as he could. Like all of us he found the conference as one way to connect with individual friends and also with his tribe. We roomed together now and then and I met many new people through Gary, who are now my friends, (and fellow mourners). Gary had at least one direct effect on the course of NCECA’s history when in 2003 he and I began golf course talks about my love of NCECA. He encouraged me to run for the Director at Large position. My colleague, Marko Fields nominated me in Indianapolis and my election led to my subsequent 8 years of service to NCECA. Gary was my good friend and a friend to many people in many circles. He was both professor and friend to his Macalester students who were often invited to his studio/apartment for dinners and dances; eating from Gary’s bowls and plates. He was well known in the Twin Cities dance community and even befriended members of his favorite local bands. He supported the Northern Clay Center, shopped at Continental Clay and initiated Empty Bowls events at Macalester creating friendships at every stop. His gatherings were fun, quirky and varied. They comfortably mixed friend circles one with another. Once my wife and I were invited for an evening of root beer taste-testing with another couple. Just for fun! I looked up to Gary, (yes, he was 6’ 5”), because he easily maintained long lasting connections. Love interests from 40 year ago remained his friends and even became friends with each other through Gary. He was more intentional about nurturing friendship than anyone I know, particularly in this era of disposable friendships. He was unique, accepting, mirthful all while living a deeply artistic life. I am blessed to have had a 23 year long friendship with him. I will miss him, as will many others. Keith Williams has been working in ceramics since 1973 and has been teaching ceramics, drawing and art history at the university level since 1989. 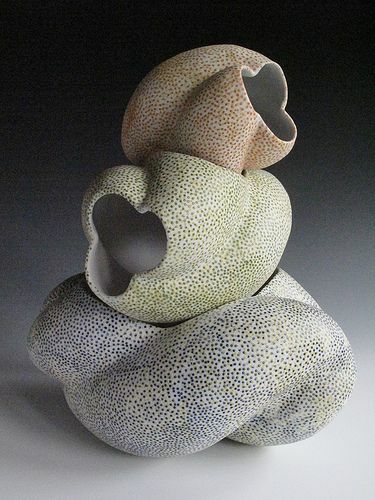 His passion for art and for quality teaching has led him to do workshops across the United States, to jury ceramic exhibition and to exhibit his own work. Williams has been an NCECA member and conference attendee since 1988. He served on the Board as a Director-at-Large in the mid-2000s. In 2008 he became President-Elect, beginning his 6 year term on the board within the presidential cycle. He continues to volunteer his time to the organization serving on committees and advising on issues as they arise. Williams enthusiastically volunteers in the student critique room. He was inducted as a Fellow of NCECA in 2015. He also maintains interests in current political affairs, science, drawing, singing, playing jazz clarinet and saxophone. He also golfs. Currently, Williams is curating a comprehensive retrospective of Erickson’s work in Concordia College’s galleries. 100% of the work remaining in his studio will be shown and for sale. The opening is 1PM on June 19th and the show will run for a month. Over 100 sculptural pieces and several hundred vessels and tiles will be shown.